Wine Room is a purple-red, as the name suggests. It does tend to visually diminish lip size, as most dark lip colors do. This color does lightly stain the lip, so as it fades it usually remains even-toned. This is a color that I tend to "re-discover" in my lipstick collection. I'll wear it quite a bit, then get distracted by something else, then find this again, and wear it a lot, repeat, repeat, repeat. 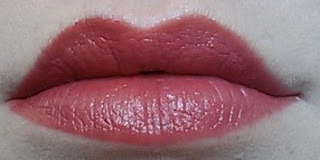 It is fairly bold, but if you aren't used to wearing bold lipcolors, it is not the boldest wine shade out there, so it may be a good way for you to test the waters. If you are used to and prefer bold colors, this might be too tame for you. I like it for office-wear, because it seems to stand above the crowd without being obvious. Now, a thin layer, applied straight from the tube with a patting motion. This color is very opaque, so even a light patting lays down the color you see in the tube. Now I blend with a lip brush. For the lip line, I apply directly from the tube, using the edge of the lipstick. Then I run over it with the lip brush. Next is another layer, applied straight from the tube, in a swipe. I don't see the point in applying thin layers if I am going to do more than one layer, because this color goes on so opaquely for me. I blended with a lip brush. I usually don't blot this color after application.